There is a very popular saying from Mahatma Gandhi which quotes “If you don’t ask, you don’t get it”. That’s where the inspiration seems to have sprouted from for this improbable new influencer marketing trend on Twitter, in India. It’s a passé debate on how influencer marketing activities are performed very poorly most of the times. Which is why brands need to comprehend the need for innovation rather than inspiration, basis the objective to implement a campaign. This mandate succeeds from the constantly evolving marketing approaches wherein most global brands are capitalizing on technologically compelled digital campaigns. But at the same time they are also emphasizing on presenting path-breaking content in sprouting forms. But eventually, where one brand successfully incepts to create a wonderful story by executing it to its optimum, emulated activities across the globe follow. Now, there is no harm in seeking inspiration as far as it works best for the brands to fulfill their objectives on digital marketing platforms. Atleast, it is still slates better than just paying influencers only to trend for an hour or two. But, somehow, most brands replicate such briefs and end updesiring parallel results. Which in most cases don’t happen. This only leads to sharing their desolation on how brand A achieved it and they couldn’t, courtesy their marketing agency. Somewhat alike was a recent situation when Twitter witnessed a rather unfamiliar appeal requesting a year-long supply of products, bartering for RTs. 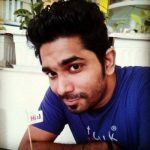 This now seems to be a popular invitation globally wherein influencers are being smartly seeded in by the brands and to successfully create fairy tale endings. 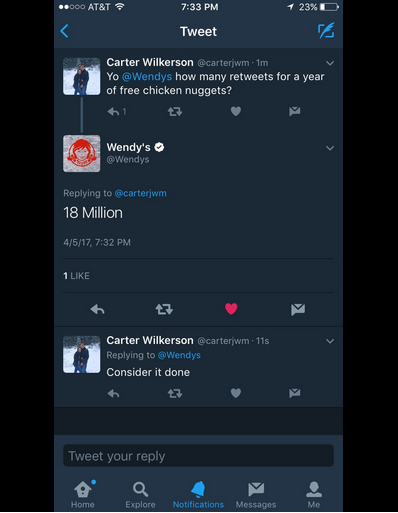 Take example of Carter Wilkerson, a student from Reno, Nevada who tweeted out to US based Fast Food restaurant chain, Wendy’s asking for a year supply of Chicken Nuggets in exchange of RTs. The brand did reply back asking for an absurd expectation of 18 Million RTs. What was interesting to see was the overwhelming response his tweet received where he managed to garner 3.6 freaking Million RTs. 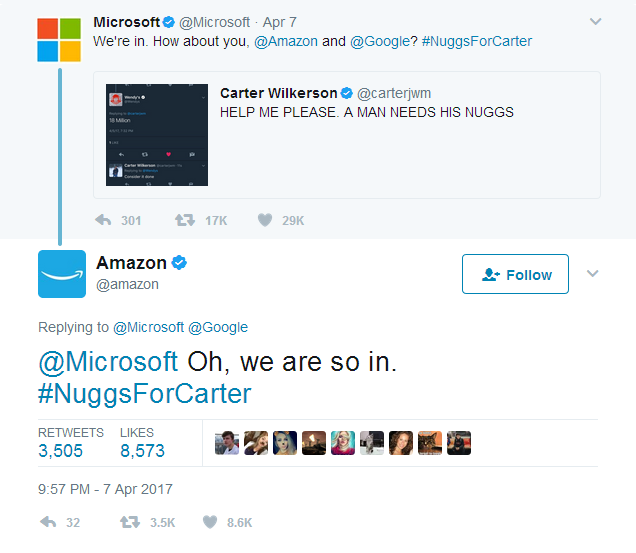 And this trending tweet not only saw people dive into the discussions with Carter and Wendy’s, but it also saw big brands like Microsoft, Apple Music and more, make the most out of this real-time conversation. While Carter’s chapter seized enough attention, brands in India have also categorically seeded in related opportunities. It was interesting to see a tweet from an influencer to Bira, asking for a year supply of beer in return of RTs. While this conversation garnered a few thousands RTs, soon many brands jumped into the opportunity to execute their own versions. While the first mover in a never-before-seen experience activity always has the advantage, other brands need to either improvise on doing something bigger and better rather than just mocking the same flow. @indiantweeter Lets get to 91k ? we will start with the first ? 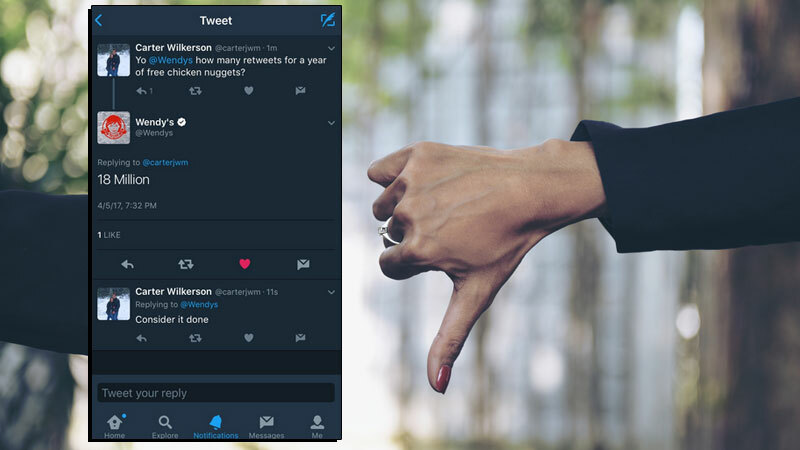 Also, knowing that followers would seek openings to craft a similar discussion points, a few brands have smartly poised themselves away from such tweets. Take example of Indigo Airlines shunning away the appeal with due respect. And a few other brands like Durex, just decided to have fun integrating themselves in the real-time conversations. Brands, remember as much you have exposure to globally popular conversations, many users on Twitter are exposed to such campaigns. If one brand does it don’t just be inspired. Innovate and improvise to explore more. Your audience is not stupid. If they have seen a similar campaign they would not always be a part of the trick unless they are rewarded or are influencer’s staunch followers. There are three types of Influencers according to me – Trend Setters, Niche, and Celebrity Influencers. Always associate with niche influencers who are loyal to your brand and talk about you just so that it comes across as a genuine conversation rather than a seeded one. It’s not just about the RTs, it is about the continuous engagement you need to sustain with the audience even post the campaign. Hence, whatever be the situation, dear brands, have a plan rather than just giving briefs to advertising professionals which state “Kuchsasta influencer activity suggest karo”. And dear advertisement professionals, don’t suggest an already-executed idea, innovate further and reach out to the right influencers to execute the campaign successfully.